Thursday: Cloudy with outbreaks of rain coming in from the west. Some will be heavy before it turns more showery later. Max 17°C. Friday: Early cloud and some showers will move away to bring a better afternoon with pleasant bright or sunny spells. A little warmer. Max 19°C. The weekend isn’t a washout and not a hot one either. Saturday: Bright spells but with a fresh NW breeze picking up which will bring in a few showers. Max 18°C. Sunday: Cool for the time of year as the breeze drags down fresh air from the NW. Again we can expect some showers but not everywhere will catch them. Max 16°C. Next week starts off drier with some sunshine but it looks likely to turn unsettled again as the week progresses. Not good news for summer-lovers. A late blog posting today as I’ve just returned from a week in Ibiza. Love the place. Bar a few cloudy days to start it was blue skies and 28-30°C all the way. More importantly, it was a drier heat so I missed all your horrible humidity until today. Shame most of us missed out on the storms, although northwestern parts of Lancashire and Merseyside had a soaking with plenty of thunder & lightning. So, just a quick forecast today to sum up the next 4 days and next week. Thursday: Bright spells but cloud increasing during the day. Some showers are possible late-afternoon. Warm but fresher. Max 21°C. Friday: Bright start again. Cloudy with rain slowly spreading in from the west. Some heavier bursts, showery in nature but easing away later. A little humid which might trigger a late-evening beefy shower. Max 22°C. Saturday: This promises to be a reasonable day. Bright spells and it should stay dry bar a rogue shower. Still pleasant in the sunshine. Max 21°C. Sunday: A cloudier day. Any morning brightness easing away and a risk of heavy rain arriving from the southwest into the afternoon/evening. Muggy. Max 21°C. Next week: Bright spells and showers. A fresh breeze at times. Temperatures about average or just below. As always, follow @ChadWeather on Twitter, for forecasts for Manchester and surrounding areas. An early blog this week so detail subject to change with it being a few days ahead. So, as always keep an eye on my @ChadWeather tweets for updates as this weekend’s weather is still uncertain. More, yes more, national media reports about a heatwave. Now don’t get me wrong, this weekend was looking much warmer and sunnier but this is now not the case and there is certainly no heatwave in the foreseeable. After a better few days recently, with showers rather than continuous rain, we see a little ridge of high pressure on Thursday. Therefore it will be a decent day with bright spells after early showers. Temperatures not that warm but feeling pleasant. Max 17°C. The high pressure was initially expected to hang around but no such luck. This means breezier on Friday with cloud spilling in from the west which could be thick enough for some light rain and hill-drizzle. Max 18°C. It gets a little tricky into the weekend as low pressure to the west and high pressure to the south-east do battle. 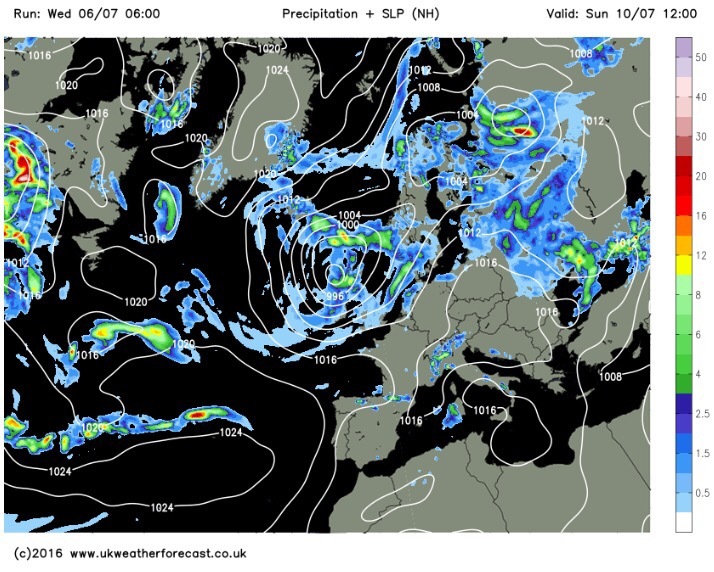 Some rain is expected early on Saturday and becoming warmer as we drag in air from Spain. It is expected to become brighter into the afternoon and in any sunshine temperatures will respond and it will feel warm and humid. Max 21°C. A similar day on Sunday. We should keep the rain at bay to the northwest, so bright spells and any breaks will lead to warm, muggy conditions. Again a Max of about 22°C but possibly higher in sunnier spots. Looking ahead and next week sees us just staying on the settled side with mainly dry and pleasant conditions. This could easily change if the Jet Stream kicks itself back into gear and it will turn wet again. Equally, high pressure could drift back in and in turn bring very warm conditions. Certainly finely-balanced and keeping me on my toes. Follow @ChadWeather on Twitter to catch all the latest weather updates for Manchester and all its surrounding boroughs. Summer? Yep, still waiting. Of course, if there’s any sign of something worth baring your chest for, I’ll let you know via @ChadWeather. After a mild night it will be a cloudy day on Thursday with some rain around. Some heavier bursts at times then later turning more drizzly especially over the hills where we could see hill-fog. Max 18°C. Not much change into Friday. Plenty of cloud with some showery outbreaks of light rain but it should dry up into the afternoon with drier slots possible. Starting to feel muggy as the southwesterly winds drag in humid air. Max 20°C. An unsettled weekend ahead but warm. 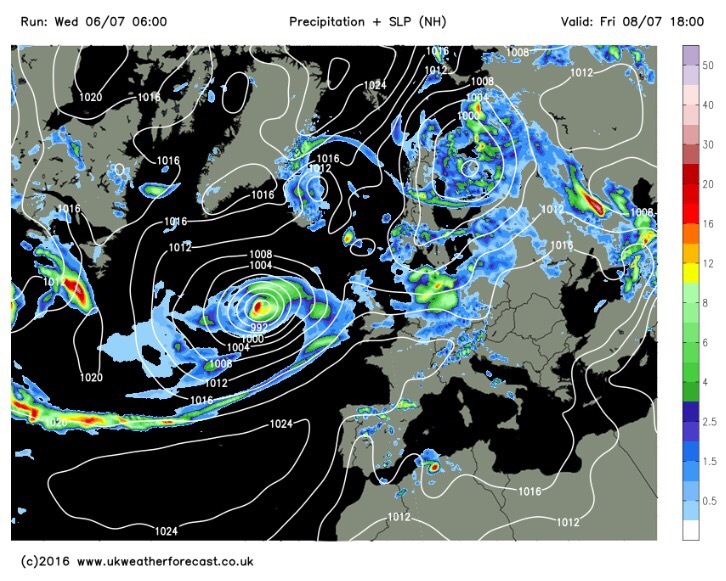 An area of deep low pressure, unusual for July, will dominate the weather on Saturday. Showers scattered around and a windy one. Feeling muggy and warm though, especially in any breaks in the cloud. Max 22°C. A showery Sunday with blustery winds, especially during showers. Feeling fresher too. Max 18°C. Looking ahead into next week and it can be described as sunshine & showers. No sign of a heatwave or prolonged sunshine. Temperatures about average. Forecast Issued: 14:45 on Wednesday the 6th of July 2016.